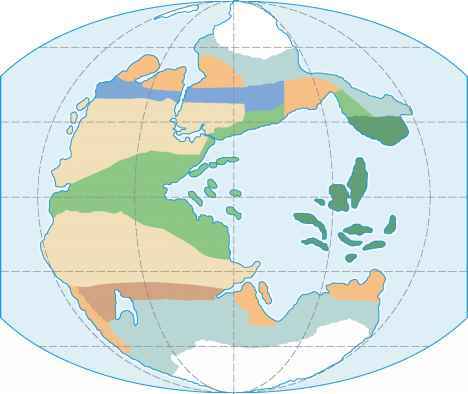 The effects on marine habitats of continental drift during the Paleozoic were vast. A discussion of the effects of these same plate movements on terrestrial habitats introduces the concept of the cra-ton. A craton is the large, tectonically stable interior of a continent that remains fairly intact over geologic time. The Paleozoic Era began with the relatively warm Cambrian Period, a carryover from the temperate Precambrian climate that melted glaciers and flooded the world with mineral-rich waters. Much of the land that had been dry during the Precambrian was flooded during the Cambrian by these warm, shallow waters. Lands that would one day make up continents such as North America, Europe, Asia, and Africa were submerged under temperate, shallow seas. 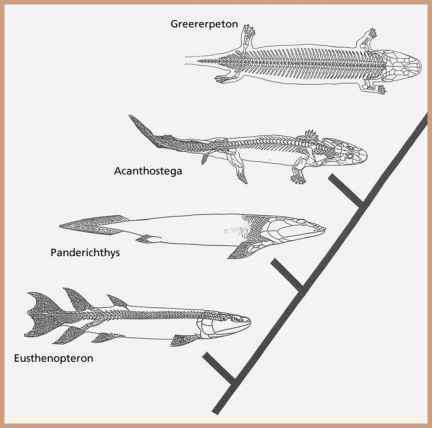 By the end of the Cambrian, however, the seas became deeper, and habitats were vastly transformed. This caused many shallow-water, near-shore species to become extinct. India. The end of the Ordovician Period was a cold span marked by widespread glaciation on the southernmost Gondwana landmass. This decimated large populations of marine organisms unable to adapt to the cold. During the Silurian Period, northern landmasses began to collide, closing the expanses of ocean between them. The pre-North American and pre-Asian landmasses remained largely under water but edged steadily toward one another while pushing back the sea. Sedimentary formations that would shift with the continental plates over time and are now exposed in Scotland, Scandinavia, and northern Europe were being laid down in thick sandy layers south of the equator. It was during this time that plant and animal life made its first significant forays onto land as soil surfaces formed for the first time and created a stable foundation for the spread of plants. The latter part of the Paleozoic began with a localized Gondwana glaciation in the Early Devonian Epoch. Mountains that would be part of the Appalachians in eastern North America were forming far to the west near the equator. The sites of New York, Beijing, and Paris were still under water. The topography of the continental cra-tons became increasingly varied in terms of elevation, climate, and the availability of varied habitats. By the end of the Paleozoic Era, Pangaea had formed several discrete terrestrial climate zones, providing more and varied habitats for the expansion of land animals. America and Africa were dry. Coal forests that now are located in Nova Scotia were forming in the Southern Hemisphere, near what today is East Africa. Asia existed as a series of micro-continents, not yet assembled. By the last period of the Paleozoic Era—the Permian—the landmasses of the Northern and Southern Hemispheres had collided to form a supercontinent known as Pangaea. Pangaea became the single landmass from which all the continents known today would diverge. Surrounding this supercontinent was a single, vast ocean called Panthalassa. Pangaea stretched from pole to pole and, because of its large mass, began to form several distinct climate zones. Some of the world became more hot and dry than it ever had been before. Seasons became more sharply defined. Ice covered the poles. The Permian Period was a time of widespread mountain forming around the world, including the ancestral Rocky Mountains in North America. Deserts covered western Pangaea. Sea levels that were relatively high in the Middle Carboniferous Period began to fluctuate regularly during the Late Carboniferous and Early Permian. Following the end-Permian mass extinction event, and crossing over into the Mesozoic Era, the world of the Early Triassic Epoch was relatively drier and hotter. These factors dramatically modified habitats and the direction of evolution for the world's plants and animals.